An interdisciplinary research team, formed by professors of The Chinese University of Hong Kong (CUHK), conducted Hong Kong’s first comprehensive and systematic synthesis of physical activity related indicators in children and youth in 2016. This led to the “2016 Hong Kong Report Card on Physical Activity for Children and Youth” (2016 Hong Kong Report Card) in 2017, with recommendations for improving the situation. 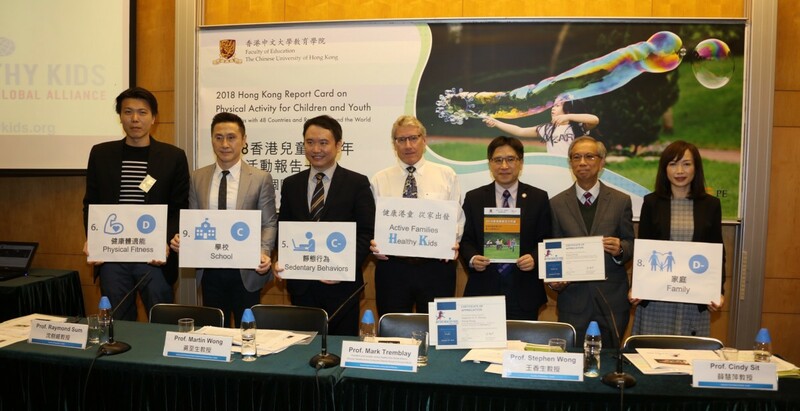 The “Active Healthy Kids 2018 Hong Kong Report Card on Physical Activity for Children and Youth” (2018 Hong Kong Report Card) is the second report card assessing the current data on physical activity among children and youth. The 2018 Hong Kong Report Card includes three new indicators, namely “Physical Fitness”, “Sleep” and “Obesity” in addition to the nine core indicators, namely “Overall Physical Activity”, “Organized Sport Participation”, “Active Play”, “Active Transportation”, “Sedentary Behaviors”, “Family”, “School”, “Community and Environment” and “Government Strategies and Investments” that were in the 2016 Hong Kong Report Card. The results of the 2018 Hong Kong Report Card were published together with those of 48 countries and regions with recommendations to increase physical activity among children and youth. The results show that children and youth in Hong Kong perform the worst in “Family” and “Obesity” with a grade D-. In “Family”, less than one-fifth of the parents exercised at least three times per week and only one-third of children and youth reported that they participated in physical activities together with their family members at least once per week. When compared with the 2016 Hong Kong Report Card, the grade of “Family” got worse, from D to D-, which reflects that family support is weak. “Obesity”, a new indicator in the 2018 Hong Kong Report Card, receives a D-, indicating that being overweight or obese is a serious problem in Hong Kong. “Physical Fitness” is another new indicator with a low grade D. This implies that the cardiorespiratory fitness levels are low for children and youth even though good surveillance of physical fitness has been undertaken in Hong Kong school settings. When compared with the 2016 Hong Kong Report Card, Hong Kong scored reasonably good grades in “Active Transportation” and “Community and Environment”. “Active Transportation” is graded B+, which is the best indicator among the twelve indicators. Around 80% of youth travelled to and from school on foot or by bicycle at least once per week and 50% of primary school children walked to and from school at least 5 times per week. “Community and Environment” is graded B. Nearly 80% of the parents felt that the neighborhood was safe with low traffic and a low crime rate, and a majority of the youth were satisfied with the sports facilities provided by the government. The performance in “Overall Physical Activity” graded C- is still low, as slightly less than half of the children and youth met the international recommendation of one hour of moderate-to-vigorous physical activity per day. The performance in “Sedentary Behaviours” worsened, from C to C-. The grade change reflects an increased use of screen-based devices for leisure purposes among Hong Kong children and youth in recent years. Hong Kong performs better in “Overall Physical Activity” (grade C-), “Active Transportation” (grade B+), “Sedentary Behaviors” (grade C-) and “Community and Environment” (grade B) that surpass the global average. In “Physical Fitness” (grade D) and “Family” (grade D-), Hong Kong is lagging behind the global average (grade C and grade D+ respectively, Table 1). When comparison is made with twenty-nine countries or regions with very high HDI (Table 2), Hong Kong performs better in terms of “Overall Physical Activity” (grade C-) and “Active Transportation” (grade B+). “Physical Fitness” (grade D) and “Family” (grade D-) are the two indicators in which Hong Kong is ranked low. The new indicator “Physical Fitness”, with an alarming grade D, falls behind many other Asian countries and regions such as Japan (grade A), Taiwan (grade B-) and South Korea (D+) (Table 3). “Active Transportation” and “Community and Environment” are the two best indicators for Hong Kong when compared with the ten Asian countries and regions (Table 3). In “Active Transportation”, Hong Kong receives the same grade as South Korea (grade B+), outperforms mainland China (grade C+) and Taiwan (grade C-) but falls behind Japan (grade A-). In “Community and Environment”, Hong Kong (grade B) is rated higher than Japan (grade B-) and mainland China (grade F), but lower than Taiwan (B+). Highly sedentary behaviour is a common problem in very high HDI countries and regions (Table 2) as well as in Asia (Table 3). Hong Kong obtains the same grade C- as Taiwan, Japan and Portugal, but outperforms South Korea (grade D), the United States (grade D), and Australia (D-), while both Scotland and Wales score a lower grade (F). The research project is supported by the Tin Ka Ping Foundation. The core members of the research team include: Prof. Stephen Heung-Sang Wong, Chairman & Professor, Department of Sports Science & Physical Education, CUHK, Dr. Wendy Yajun Huang, Assistant Professor, Department of Sport and Physical Education, Hong Kong Baptist University, Prof. Martin Chi-Sang Wong, Professor, Jockey Club School of Public Health and Primary Care, CUHK, Prof. Cindy Hui-Ping Sit, Associate Professor, Department of Sports Science & Physical Education, CUHK, Prof. Raymond Kim-Wai Sum, Associate Professor, Department of Sports Science & Physical Education, CUHK, and Mr. Sam Wing-Sum Wong, Executive Director, Physical Fitness Association of Hong Kong, China.